Are you a hands-on problem solver? Looking for a rewarding career that pays well? Want to work in a field that will always be in demand? Then a career in HVAC is perfect for you! HVAC is an acronym for heating, ventilation, and air conditioning. Essentially, HVAC technicians work on all of those systems in both residential and commercial buildings, as well as certain types of vehicles, to keep the climate comfortable throughout the year. As an HVAC technician, you will repair, replace, or install the components that supply the heating, cooling, and ventilation to residential and commercial buildings. HVAC techs are trained to use a variety of work-related tools and equipment. Beyond the basics of heating and cooling, HVAC education will prepare you to be a technician who masters carbon monoxide testers, torches, combustion analyzers, and voltmeters. Using these tools will become second nature once you’re trained and experienced. Finding skilled workers to fill the growing vacancies is proving to be quite difficult, particularly in the heating and cooling industries. By 2026, bls.gov projects that HVAC employment opportunities will increase by 15 percent. That means there will be a lot of qualified HVAC techs needed in the workforce. Based on supply and demand, now is the perfect time for you to seriously consider becoming an HVAC technician. If you were to visit all the job postings for HVAC technicians, then you would see employers listing the traits they’re looking for in potential employees, including both interpersonal skills and technical skills. 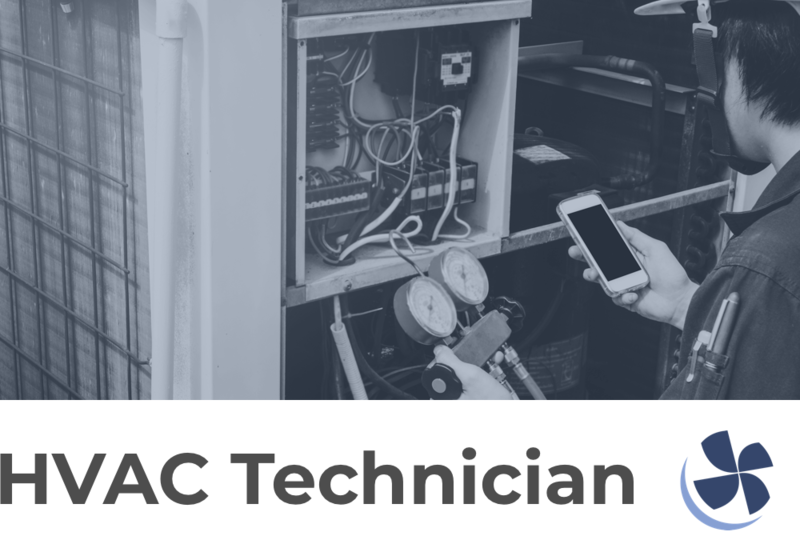 As an ideal HVAC technician, you will be able to communicate effectively, be always up-to-date on the latest industry trends, and solve problems on-the-fly to provide the highest quality of service. Pass a very basic math test. Pass a drug screening. Find a job as an HVAC technician! After you receive your high school diploma or GED, you can apply for an apprenticeship program or attend trade school. An apprenticeship program is a paid training position that lasts between 2-5 years. It’s a great way to start earning money while learning a trade.You must have 2,000 experience/work hours plus 144 hours of coursework per apprenticeship year. The best bet for scoring an apprenticeship is to apply through your local chapter of a trade organization. Through these apprenticeship programs, you’ll be learning how to read and use blueprints, understand safety practices, proper use and care of tools, and ventilation and air conditioning system designs. While doing an apprenticeship is certainly a great option, some employers are leaning more toward hiring HVAC technicians that have been trained through a trade school or community college. Trade schools typically take between 6-18 months to get your certification. Community colleges will take two years if you attend full time. In both instances, you’ll take courses in classrooms, as well as be exposed to hand-on, practical situations to provide a well-rounded curriculum. Trade schools last between 6-18 months. Community college takes 2 years if you attend full time. Licensing can cost anywhere between $75-$300 depending on where you live. Certification fees can range from $155 to over $200 depending on which certification you're pursuing. Some states will require you to complete an apprenticeship or have 2-5 years of work experience before you can become licensed. You’ll need to check with your state to find out the exact requirements, as well as the preferred educational route. The reason for the price differences for the education, licensing, and certification costs is due to varying requirements and regulations for each state. Financial aid may be available, and options should be discussed with the financial aid department of the institution you’ll be attending. Check our complete financial aid guide here. What Type of Courses Will I Take In HVAC School? There are a couple of options when it comes to getting your HVAC technician degree or diploma. You can join a hybrid program, which is both online and through your local school, or you can choose to go the traditional route of attending classes on a school campus. You’ll find that most programs consist of fairly similar courses so pick the program best suited to your needs. Principles of refrigeration: Learn the basics and applications of refrigeration systems. Residential gas heating: Learn about gas-fired appliances, along with troubleshooting and repairs of the systems. HVAC building systems: Learn how to design and construct comfort control/climate control systems for commercial buildings. Heating and cooling systems: Learn how to apply sizing calculations to climate control. HVAC is considered to be one of the highest-paying skilled labor careers. In 2017, the median pay of HVAC technicians was over $47K (bls.gov, 2018). Salaries vary by location and industry, so your paycheck could vary greatly from the median. HVAC apprentices earn about half of what an experienced HVAC technician makes. In terms of your apprenticeship experience, it’s important to remember that the more you learn, the more you’ll earn. Most HVAC technicians work a full-time position, and their work schedules could vary based on their employers. 5 top paying states for HVAC technicians are District of Columbia ($68K), Hawaii ($62K), Alaska ($64K), Illinois ($62K), and Connecticut ($61K). The top paying industries for HVAC technicians are Aerospace products and parts mfg. ($74K), Electric power generation, transmission, and distribution ($72K), Scientific research and development services ($68K), Specialty hospitals ($67K), and Motor vehicle parts manufacturing ($67K). Employment growth for HVAC technicians is projected to be much faster than the average of all other occupations, with the rate anticipated to double other occupations through 2026 (bls.gov, 2018). There will be over 48K new positions opening during that time frame. Humans have a strong desire to live and work in a climate-controlled environment. As HVAC technology becomes more sophisticated, the demand for knowledgeable and qualified technicians will continue to grow. Licensing is required to work as an HVAC technician. It proves to employers and customers that you’ve been properly prepared for the job. In order to become licensed, you must complete some sort of training, whether it’s through an apprenticeship, a trade school, or a community college. Once your formal education is finished, you will be eligible to take the knowledge-based licensing exam. The test content and length varies by state, as well as the testing location. The HVAC exam will test you on every aspect of HVAC installation and repairs. If you’re going to be working with refrigerants, you’ll be required to take the Section 608 Technician Certification exam, as well. The exam is given through the International Code Council. Each state has its own location where the exam is given. You must complete an HVAC training program. Certification and licensing and two different things. The license proves you’ve successfully completed your training and have the basic knowledge and skills to effectively do your job as an HVAC technician. Certifications, on the other hand, are a step above the licensing aspect. With certifications, you'll prove you have broadened your HVAC horizons. Specializations are available in a few different areas. The Environmental Protection Agency (EPA) requires anyone handling refrigerants to be certified. All HVAC technicians must have, at the very minimum, the EPA 608 Certification so that they can legally do the bare-bone essentials of their trade, as well as the nationally recognized NATE Certification, and the Excellence Certification. Type 1 allows an HVAC tech to handle small appliances that contain less than 5 pounds of refrigerants (i.e., a refrigerator). Type 2 will allow the HVAC professional to deal with high-pressure refrigerants. Type 3 allows the handling of low-pressure refrigerants. The fourth type is ‘Universal’, which includes Types 1, 2, and 3. North American Technician Excellence (NATE) Certification: This is one of the highest achievements for HVAC professionals. The NATE Certification is not required; however, it’s nationally recognized and highly respected which makes it a really good one to get. You become NATE certified by taking and passing the exam. You can earn a certification in areas such as air-conditioning, air distribution, and managing gas furnaces. HVAC Excellence Certification: To be eligible to earn the Professional-level HVAC Excellence Certification, you must have a minimum of two years of on-the-job experience and pass the knowledge-based exam. You can also receive a Master-level HVAC Excellence Certification. You must meet the requirement of a minimum of three working years before you can take a portion of the knowledge-based exam. The more certifications you have under your belt, the more desirable of an employee you’ll become! Certifications give you even more work credibility because they reinforce to employers and clients that, not only do you know your stuff, but you know it exceptionally well. Having certifications give employers and consumers a sense of security that the work is in very capable hands. HVAC careers are plentiful, and if you’re willing to put in the time and become licensed and certified as an HVAC technician, you should have no problem finding your dream position. Our country is short-handed in skilled HVAC technicians. We need YOU!